BERLIN—Asustek Wednesday added new 6-inch and 7-inch models to its Fonepad lineup as well as two new 8- and 10-inch Memo Pad tablets. The new tablets were unveiled at the IFA trade show here, They run on Android 4.2, also known as Jelly Bean. The new Fonepad 6 Note tablet, which is also used for as a telephone, has new hardware that includes a faster Intel Atom processor. The Fonepad 6 Note, which falls into the "phablet" category, has a 6-inch screen that can display images at a resolution of 1920 by 1080 pixels. The tablet weighs 7.4 ounces, is just under half-an-inch thick, and runs on an Intel dual-core Atom Z2580 processor code-named Clover Trail+. The Note 6 supports only 3G connectivity, which means it could be targeted at developing countries. The phablet’s battery provides 23 hours of 3G talk-time and 6.5 hours of 720p video playback, according to Asus. The Note 6 provides up to 32GB of storage and 2GB RAM. It also has an 8-megapixel rear camera and a 1.2-megapixel front camera. Other features include a micro-USB port, a micro-SIM slot and a micro-SD slot for expandable storage. The Fonepad 7 (shown above) has a 7-inch screen, weight just about 12 ounces, and runs on an Intel Atom processor. The device offers up to 28 hours of 3G talk time and 10 hours of video playback on a single battery charge, according to Asus. The tablet is 0.41 inches thick and can display images at a resolution of 1280 by 800 pixels. Other features include up to 32GB of storage, a 5-megapixel rear camera, and a 1.2-megapixel front camera. While the Fonepads are designed for telephony, the new Memo Pad tablets are targeted at budget buyers. The Memo Pad 8 and Memo Pad 10 run on quad-core processors and have screens that can display images at a resolution of 1280 by 800 pixels. The Memo Pad 8-inch tablet is the size of a typical 7-inch tablet, but has more screen space. It weighs around 12.3 ounces, and offers eight hours of battery life on a single charge. Other features include a 5-megapixel rear camera, a 1.2-megapixel rear camera, and up to 8GB of storage. 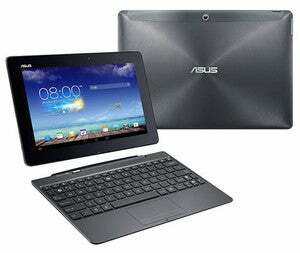 The Memo Pad 10 weighs around 18.4 ounces, and offers around 9.5 hours of battery life on a single charge, Asus said. It has a 2-megapixel rear camera, a 1.2-megapixel rear camera, and up to 16GB of storage. Asus also announced the Transformer Pad TF701T multimedia tablet, which has a 10.1-inch screen and could be the company's fastest tablet to date. Notable features include a display with a resolution of 2560 by 1600 pixels and an Nvidia Tegra 4 processor, which is one of the faster ARM tablet processors available outside of Samsung’s Exynos 5 chips. Other features include a 5-megapixel rear camera, a 1.2-megapixel front camera, and a USB 3.0 port to connect high-speed storage devices. The TF710T weighs 20.5 ounces and offers around 13 hours of battery life, Asus said. However, the battery life could change depending on usage. For example, playing games will drain the battery much quicker. Information on pricing and availability of the tablets was not immediately available. Asus did not immediately respond to requests for comment.